Whether you’re moving industrial equipment across the city or sending heavy duty mining machinery interstate, transporting heavy loads is complex and challenging. From navigating potential hazards and risks to ensuring that time constraints and productivity requirements are met, transport logistics requires the skill, expertise and experience of a professional. That’s where Hevi Haul comes in. As Perth’s experienced transport logistics team, we specialise in organising and executing the moves of a wide range of heavy equipment, machinery and items. From same city moves to transporting goods across to the east coast, our professionals provide innovative and efficient solutions to power fast and safe transportation. We’re one of few companies specialising in heavy loads, low loads and oversized loads. With a huge range of unique requirements and challenges, our team understands the ins and outs of moving different loads with maximum efficiency and success. Transporting heavy, low and oversize loads from Broome to Esperance and everywhere in between, we simplify logistics and take the guesswork out of transportation. Our team has over 20 years of experience in moving a wide variety of loads across cities and through states. Backed by a specialised fleet of reliable, sturdy and versatile movers and trailers, all transportation projects are carried out with precision. We’re constantly updating our skills, knowledge and training in order to provide competitive transport logistics that lead the way in innovation and efficiency. Essential for the success of all mining works and projects, mining equipment and machinery is particularly valuable, heavy and often expensive. 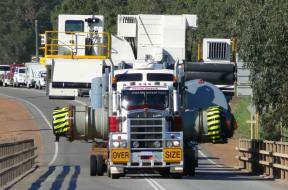 When it comes to transporting mining equipment, we understand the importance of safety and efficiency. Throughout your entire move, you’ll be supported and guided by one project manager who is dedicated to the success of your project. Able to answer questions on demand and provide insight into the Hevi Haul process and approach, you can be confident that your mining equipment and machinery is in good hands. Not only within Perth and WA, Hevi Haul moves loads of various sizes throughout Australia. From the NT to SA over to the major eastern cities, we power business and productivity with specialised heavy transport logistics services. Moving large and oversized loads on interstate highways can be particularly daunting. With long stretches of roads and high speed limits, a variety of issues can arise if not prepared for accordingly. At Hevi Haul, we’ve got the fleet, equipment and personnel required to make long-haul transportation smooth and hassle-free. Specialising in moving heavy and oversized loads interstate, our professionals rely on proven processes and routes to take the guesswork out of logistics and to complete projects with expertise. Heavy and oversize transport logistics is complex. Impacting a wide range of stakeholders, moving large loads presents a variety of unique and tough challenges – particularly when it comes to interstate moves. As experienced transport logistics professionals in Perth, Hevi Haul provides end to end services to take the stress and confusion out of transport logistics. Specialising in managing entire projects from start to finish, we’re able to ensure that your load is transported with efficiency and safety. Not only about the physical transportation of your load, transport logistics involves managing every aspect of your project. In order to secure a successful move, we complete feasibility studies, cranage, jacking and skating, traffic management, pilots and police escorts, road closures, road surveys, the obtaining of permits and discussions with authorities to make your move hassle free. Our expertise, knowledge and services are supported by a reliable and extensive fleet of powerful vehicles and trailers. We’re able to carry loads up to 9.5 metres wide, 55 metres long and over 190 tonnes in weight with confidence and ease. For loads exceeding standard specifications, we utilise the services of professional and reputable subcontractors who specialise in moving significantly oversized loads. Sharing a commitment to quality and transparency, our subcontractors are all specially trained and experienced in moving loads of all sizes across any distance. Whatever the size of your load, let our professionals craft a personalised logistics solution for your move. When you choose Hevi Haul, you can feel confident knowing that you’ll be updated on the movement of your loads at every step of the journey. Instead of wondering where your load is and searching for the right person to ask, you’ll be assigned one project manager who understands your requirements and project inside out. Responsible for your project from start to finish, your project manager ensures that you’re informed of every movement and are updated on any developments and changes. Don’t be left in the dark when it comes to moving valuable equipment, machinery and loads. Choose Hevi Haul for a project manager that keeps you in the loop. Throughout all moves and across every project, safety is our top priority. From protecting your load and equipment to ensuring the safety of the general public and other road users, we take safety seriously. Our staff are regularly trained on evolving safety protocols and are fully committed to upholding strict safety standards across every job. We’re proud to have a 100% safety record across our services, demonstrating our commitment to protecting people, loads, infrastructure and the environment. We actively encourage our employees to recommend changes based on practical experience in order to minimise risks and hazards to all stakeholders. For your peace of mind, we carry comprehensive insurance and full comprehensive marine transport insurance. Don’t compromise the safety and integrity of your equipment and machinery. At Hevi Haul, our Perth transport logistics professionals specialise in moving heavy and oversize loads across the region and interstate. Supported by a fleet of premium movers and trailers and backed by significant industry experience and know-how, we simplify complex logistics and provide you with efficient and adaptable solutions. Find out more about transport logistics in Perth and across Australia. Contact us on (08) 9356 9799.